CarGurus has 8,559 nationwide Patriot listings starting at $1,995. The 2017 Jeep Patriot, a 5-passenger compact crossover, is similar to the old World War II Jeeps in name only. But what today’s Patriot, which was introduced for the 2007 model year, brings to the table is a budget-price, an exterior design that has worn well over the years, and at least some of the creature comforts that families have come to expect from vehicles in this segment. The Patriot, which is available in 4 trims, the Sport, Sport SE, Latitude, and High Altitude, is slated for deletion from the Jeep lineup (along with its Compass cousin) in the near future. A replacement, tentatively labeled the Compatriot, and with the refinement, features, performance, and upgraded styling that are noticeably lacking in the current Patriot stable, is on Jeep’s Michigan test track and is expected to be available for the 2018 model year. The 2017 Patriot stays around at this point mostly to help keep parent company Fiat Chrysler Automobiles a viable force in the small crossover market, so don’t expect any changes or upgrades from the current model. Look for the Patriot to boast standard front-wheel drive (FWD) on all trims, with both the Freedom Drive I and the hardier Freedom Drive II 4-wheel-drive (4WD) packages again optional. The Freedom Drive I 4WD system is essentially an all-wheel-drive configuration with a locking center differential that allows a 50/50 distribution of torque to the front and rear wheels to get you out of deep snow or mud. The Freedom Drive II setup is a more off-road-capable 4WD configuration that includes a dedicated off-road-ready differential locking system, simulated low-range gearing with crawl mode, and descent control. All of this, along with a terrain-taming suspension and skid plates, is good enough to earn those trims packing the Freedom Drive II package a Trail Rated badge for off-road prowess. Powering FWD Patriot trims is a standard 2.0-liter inline 4-cylinder (I4) engine mated to either a 5-speed manual transmission or a continuously variable transmission (CVT) that’s available on the FWD Latitude and High Altitude. This powertrain puts out 158 hp and 141 lb-ft of torque, with mileage estimated at 23 mpg city/30 highway/26 combined with the manual and 22/26/24 with the CVT. Those Patriots with 4WD (Freedom Drive I or II) get a standard 2.4-liter I4 that throws down 172 hp and 165 lb-ft of torque under the direction of either the 5-speed manual transmission, a 6-speed shiftable automatic transmission, or, with Freedom Drive II 4WD, the CVT. Look for fuel-efficiency estimates of 21/27/23 with the 6-speed automatic and Freedom Drive I and 20/23/21 with Freedom Drive II. This engine is also available to the FWD Latitude, with mileage figures estimated at 23/28/25 with the manual and 21/28/23 with the automatic. Given the Patriot is offered at bargain basement prices, consumers might forgive the distinctly low-end look and feel of cabin appointments, with much hard plastic and seats that are less than ideal for extended trips. Noise and vibration, especially from those trims carrying the CVT, is also constant, while this small crossover’s ride tends to be a little rough at times. Though even the base Sport trim has standard cruise control, all trims offer only tilt-wheel steering with no telescoping steering available. The Sport also comes with standard satellite radio and optional air conditioning. Higher trims offer such extra perks as a fold-flat front passenger seat, upgraded wheels, leather upholstery, and, in the High Altitude, a standard power sunroof. Option packages include the Power Value group, with keyless entry and heated power-adjustable outside mirrors, and the All-Terrain Capability group, sporting 17-inch all-terrain tires, an engine block heater, and tow hooks. Further options include remote engine start, Bluetooth-integrated Uconnect infotainment, GPS navigation, a remote garage door opener, and a Boston Acoustics audio system boasting unique tailgate-mounted flip-down speakers. Look for 2017 Patriot trims to include standard safety equipment like 4-wheel antilock brakes (ABS), traction and stability control, front side-mounted airbags, and front and rear head curtain airbags. All Patriot trims also feature standard front fog/driving lights; automatic headlights, a rear-view camera, and descent control (4WD-equipped trims) are each offered as safety options, along with a crawl ratio on trims equipped with Freedom Drive II 4WD. Some notable omissions to the Patriot’s safety features include lane-keeping assistance, blind-spot warnings, adaptive cruise control, and collision warnings and mitigation. While outward visibility is excellent with the Patriot’s elevated stance, the National Highway Transportation Safety Administration (NHTSA) gives it only 4 out of 5 stars for overall crashworthiness, with a mere 3 stars awarded for front impact and rollover protection. The Insurance Institute for Highway Safety (IIHS) gives the current Patriot its best score of Good on all tests other than the more demanding small-impact frontal overlap, where it received a worst-possible score of Poor. Rivals to the Patriot for the upcoming model year include the Subaru Forester, Honda HR-V, and Mitsubishi Outlander Sport. Each of these challengers offers more refinement, better performance, and lots of state-of-the-art features. None, though, can match a Freedom Drive II-equipped Patriot for trips well off the beaten path. 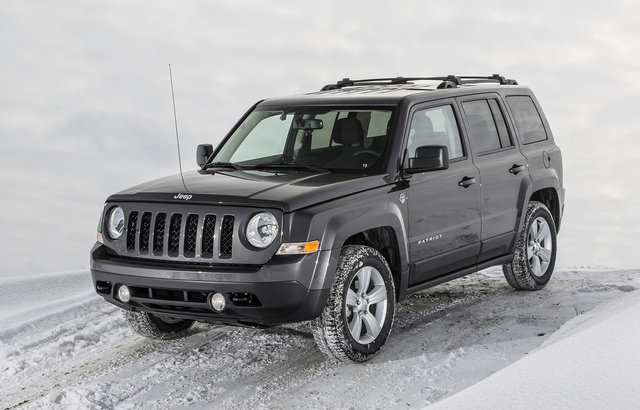 What's your take on the 2017 Jeep Patriot? TheHorror "Freedom Drive"? Me thinks it dost protest too much; Probably to distract from it's shared Mitsubishi platform. Users ranked 2017 Jeep Patriot against other cars which they drove/owned. Each ranking was based on 9 categories. Here is the summary of top rankings. Have you driven a 2017 Jeep Patriot? My wife's 2017 Jeep Patriot sputters when she turns a corner. Anyone know what would cause this? Lights burn unenessarily, so to turn off this feature is important to me! Using the remote to unlock ,headlights turn on. How to turn this feature off? What Takes The Place Of The Patriot?